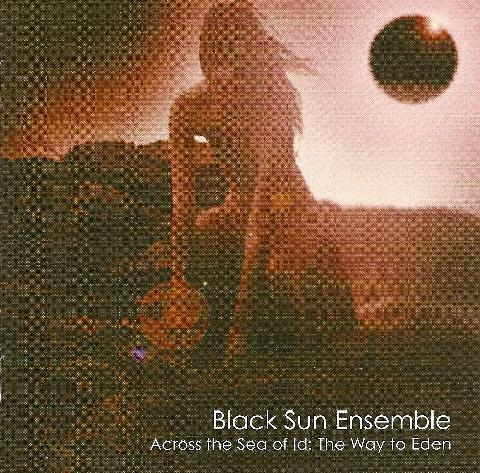 Black Sun Ensemble - "Across the Sea of Id: The Way to Eden"
Those who read the review of the last Black Sun Ensemble album in AI #35 and the accompanying interview with Eric Johnson will have noticed his comments about Jesus Acedo's state at the time, and wondered if there might ever be another album from the band. According to the promo sheet the music on Across the Sea of Id: The Way to Eden, started out as a side project between Jesus Acedo and Eric Johnson, and ended up as what will probably be the finally collaboration between Jesus and the members of Sun Zoom Spark, who are pretty much responsible for having helped Jesus rekindle the Black Sun Ensemble spirit nearly a decade ago. The album is a mixture of re-recordings of older songs plus new material. The music is primarily acoustic driven, dreamy, pleasantly melodic, and spiritually uplifting. Among the highlights on this 11 track all instrumental album is "Walking Down Rosemary Lane". Acoustic guitar dominates but electric guitar floats alongside as well playing sparse, enchanting melodies. Slow paced… dreamy… still psychedelic. Like drifting through the Arizona landscape that's home to these musicians. "La Paz" has a Shoegaze feel, though the psychedelic desert sound is still there. Simple but beautiful guitar soloing plus ditto from the saxophone makes this a short but entrancing piece. Imagine Jesus Acedo replacing Dave Gilmour in Pink Floyd and you might get something like the reworking of "Blues for Rainer". And the tasty violin from John Axtell is a plus. "Across the Sea of Id" features dreamy acoustic magic carpet ride psychedelic Blues. Percussion adds the spacey qualities to the lullaby like acoustic driven "Perelandra". "Baphomet's Curse" is one of the more full band tracks of the set. And even without vocals this is pure SONG. Very nice. "Evil Spirit" is unlike anything I've heard from Black Sun Ensemble. Tough to describe but it kept conjuring up images in my mind of David Lynch films. And then we've got the 13 minute rendition of "Sky Pilot Suite" (the original from the 1999 Sky Pilot album was 22 minutes long). Like the original, this version is characterized by Eastern influenced psychedelia, with lots of sitar, some acid laced guitar, saxophone, and an all around trippy vibe. A great cosmic jam track and the heaviest music of the set. Finally, this is an enhanced CD with a video of "Dove of the Desert". Directed by drummer John Paul Marchand, the visuals alternate between shots of the band playing (including close-ups of Acedo's fingers dancing across the fretboard), photos, shots of the dersert, and psychedelic efx. Very well done. Well… will this really be the last we hear from Jesus Acedo? If so, he's left quite a legacy and I hope he appreciates the push he's gotten from the Sun Zoom Spark gang, because we surely wouldn't have all these great albums on the Camera Obscura label if not for them (AND Camera Obscura honcho Tony Dale). Black Sun Ensemble fans will know this is a must have. For more information you can visit the Black Sun Ensemble web site at: http://www.blacksunensemble.com.